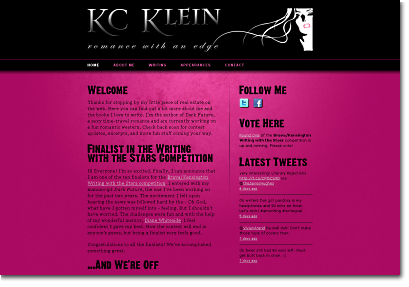 KCKleinBooks.com is the online home of author KC Klein. KC needed a website, fast. She had become a finalist in the Brava/Kensington Writing with the Stars competition and needed a site to start developing an online presence. So we worked together to find some artwork that would fit her style, came up with a design we liked, and away we went. Again, nothing crazy to see here, just a nice, simple site with clean markup and CSS design. And yes, it's pink. Pink is good. Pink works. KCKleinBooks.com was created using plain 'ole HTML and CSS. Any client-side stuff was done using JQuery.